Welcome, we have a range of products to help safeguard all different types property, people and pets. You can manage any information including contact details for your products via our website 24/7. If you decide to sell an item with a Find Return product attached you can also transfer it to the new owner, this is great for school uniforms, smartphones, laptops etc. 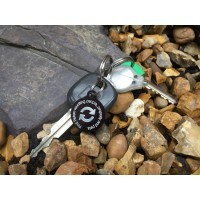 Our metal universal tag can be used for keys, pets, luggage and a multitude of other items. On the f..
Our sew-in satin ribbon labels are a modern approach to traditional name labels and offer many benef..
Our property labels are small, durable and contain all of the information required to get your lost ..
Our universal tag can be used for keys, luggage and a multitude of other items. The Find Return serv..
Our drone stickers are small, durable and contain all of the information required to get your lost d..